It's time to get serious about mezcal. The days of dismissing it as a second-rate spirit with a dead insect in it are over. Mezcal producers have become much more sophisticated, and high-quality mezcal is proliferating at good cocktail bars and liquor stores near you. Leading the pack is Del Maguey. Rather than operating as a single distillery, Del Maguey works with a collection of small-scale producers making mezcal using traditional methods in various villages around the Oaxaca region of Mexico. According to the company's website, each of its mezcals is made by a family-run producer in a small village. Thus, Del Maguey markets most of its mezcal line as "single-village mezcals," which are also certified by the USDA as organic. The company celebrated its 20th anniversary last year. Ron Cooper started it in 1995 with the intention of expanding the availability of artisanal mezcals produced through traditional means. Cooper himself is clearly very passionate about mezcal--there's a great interview with him on the Del Maguey site. But he also has a background in art, which is reflected in the beautiful and unique way Del Maguey packages its mezcals in green bottles each with a different colorful illustration. Some of these works were designed by Ken Price, an artist friend of Cooper's who died in 2012. Del Maguey definitely has a cool factor. Its mezcals are prominently featured on the bar shelf at the renowned East Village bar Mayahuel (their spirits menu boasts 13 of the company's mezcals). Del Maguey even teamed up with José Andrés recently to make a ham-flavored mezcal. What they don't have...a worm larva in their bottles, a practice I've read came about to mask the flavor of inferior mezcals, which Del Maguey certainly are not. Our recent visit to Mayahuel is what sparked my renewed interest in mezcal. I've been a fan of their Vida mezcal for sometime, but wanted to try some of the other types. These can be harder to find, but I am seeing them more often in liquor stores, including in D.C. at Eye Street Cellars, a relatively recent addition to Mount Vernon Triangle, which carries a good selection. I picked up several bottles there recently. 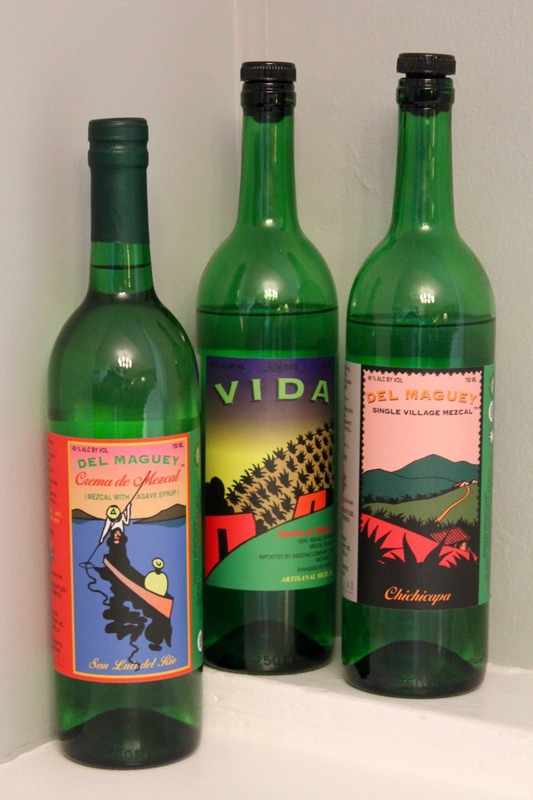 Vida is a great place to start with the Del Maguey line. It's smoky, but not intensely so like some mezcals. It's very clean and refreshing. It's a wonderful choice for cocktails, both because it's easy to get ahold of and mixes well. Vida can usually be found for around $35, which makes it an affordable mezcal (they can get quite pricey), particular for something of this quality. Vida comes from San Luis Del Rio. Moving into something a little different, there's Chichicapa, named after the village where it's made (most of the Del Maguey mezcals, except for Vida, which means "life" are named for the villages where they are made). It's not as smoky as Vida, but has a spicier, more complex flavor. Lastly, we tried Creme de Mezcal, which is a little different, since it's 90 percent mezcal and 10 percent agave, making what some would call a "mezcal liqueur." The agave's sweetness further smooths out the mezcal, making this a very sippable concoction. I could see this being very useful for crafting mezcal cocktails without needing the addition of agave or simple syrup. So how does mezcal work in cocktails? Rather well actually. I love that they combine the characteristics of a good tequila with the smoky nose akin to a peaty Scotch. Mezcals are a natural to pair with citrus, but they also work with other fruits, like pears, as well as coffee, chocolate and herbal flavors. They also mix well with other spirits--tequila, obviously, but also rum. I recommend tasting your mezcal before mixing it, since some mezcals work better with other flavors (I find that the smokier mezcals can be more challenging for mixing). One of the best-known mezcal cocktails is the Oaxaca Old Fashioned, which was created by Phil Ward for Death & Co. The Oaxaca Old Fashioned is brilliantly simple: replace the Old Fashioned's whiskey with mezcal and use agave nectar instead of of sugar. Although the original recipe called for Angostura bitters, using mole bitters introduces yet another Oaxacan flavor. Death & Co. also originated the Naked & Famous, a drink similar to the Last Word made with mezcal instead of gin. Of course Mayahuel makes many amazing mezcal cocktails. Among them are the Division Bell, a sunny take on a mezcal cocktail with Aperol, and the Smoked Palomino, a citrusy mezcal-sherry cocktail. Replacing some or all of the tequila in a margarita makes for a smoky take on a familiar classic. 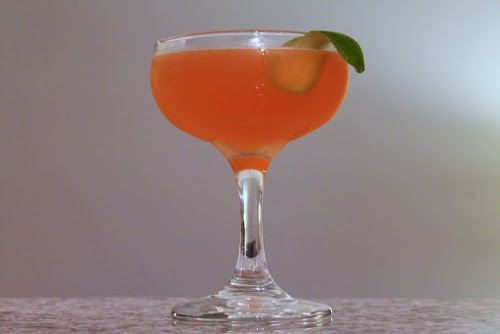 A little chili pepper adds nice heat too to the Margarita on Fire, and Dave Arnold's version of the classic frozen margarita made with mezcal, orange liqueur and chartreuse is a brilliant revision of that summer favorite. I also like this smoky pear margarita. For a hot drink, warm up on a cold day with Spicy Aztec Hot Chocolate with Mezcal, a recipe that comes from Serious Eats' J. Kenji López-Alt. For other ideas, Del Maguey's website has an extensive list of mezcal cocktails. The Going Back to Mezcali piqued my interest, both because it sounds delicious (and is) and because it's by Donato Alvarez of Sixth Engine in D.C. I changed the garnish a bit: instead of the cold-smoked lime peel, I did a flamed lime peel. 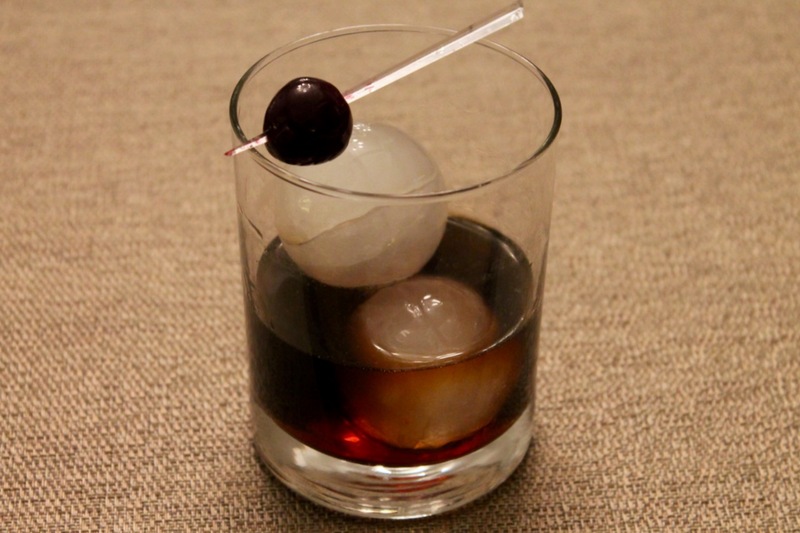 Lastly, I concocted the 6666 Miles below, as a sort of nod to the Oaxaca Old Fashioned. Like that drink, I took an existing classic--the Black Russian--and replaced its base spirit with mezcal. I also added some mole bitters. I call it 6666 Miles because that's the approximate distance from Moscow to Mexico City. Combine mezcal, coffee liqueur and bitters in a cocktail mixing glass with ice. Stir until very cold. Strain into a rocks glass with ice. Garnish with cherry. Adapted from a recipe by Donato Alvarez of Sixth Engine, Washington, D.C.
Add cucumber to a cocktail shaker and muddle. Fill with ice and add the mezcal, Chartreuse, Aperol and lime juice and shake until very cold. 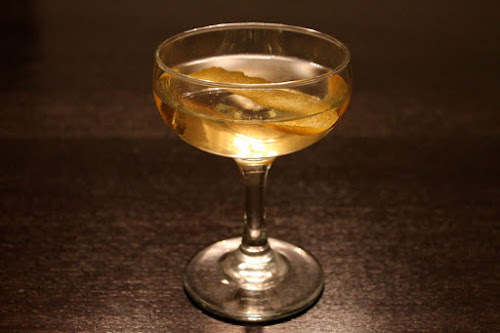 Double-strain into a chilled cocktail glass. Garnish with the flamed lime peel.